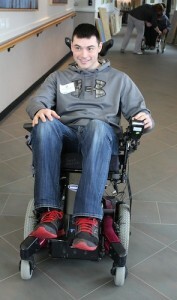 Rutgers student Matthew Santoro familiarizes himself with a power wheelchair. 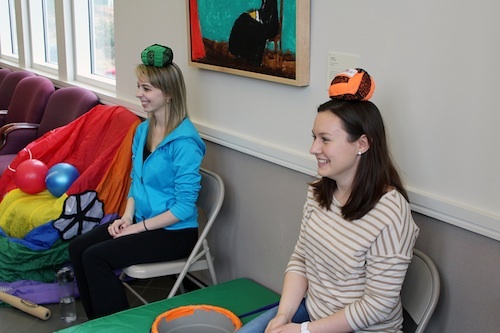 As physical therapy students from Rutgers New Jersey Medical School rotated through stations, experiencing everything from wheelchair maneuverability to adapted physical education, they absorbed a sense of appreciation for the challenges facing people with developmental disabilities. The occasion was the students’ annual visit to Matheny to learn about the therapies and equipment that help enhance the lives of those with physical disabilities. Matheny understands that it can’t provide healthcare for everyone with a disability, but it can help ensure that future healthcare professionals understand how to care for and treat people with developmental disabilities. Christianna Rocco, left, and Danielle Shellhammer learn how to use their heads while playing adapted basketball. This entry was posted in Uncategorized and tagged physical therapy, Rutgers University. Bookmark the permalink.